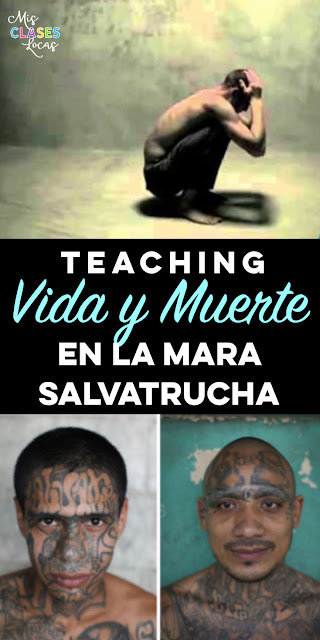 I just taught the novel Vida y Muerte en la mara Salvatrucha from Fluency Matters for the first time as a full class novel unit in Spanish IV. I have used it the past two years in literature circles and Individual Novel Study. I was so glad to have the new 2016 Teachers Guide to lean on. There are so many ideas that I actually had a hard time trying to choose what to do each chapter with so many engaging options. The students really liked the novel and how raw and real it was. We had a lot of deep discussions and even those who are usually a little tougher to get interested got hooked being able to talk about topics such as gang violence, tattoos and drug cartels. The themes are great for older, upper level students. As always, I do not claim to be an expert at teaching novels, and am learning and growing with each new attempt. 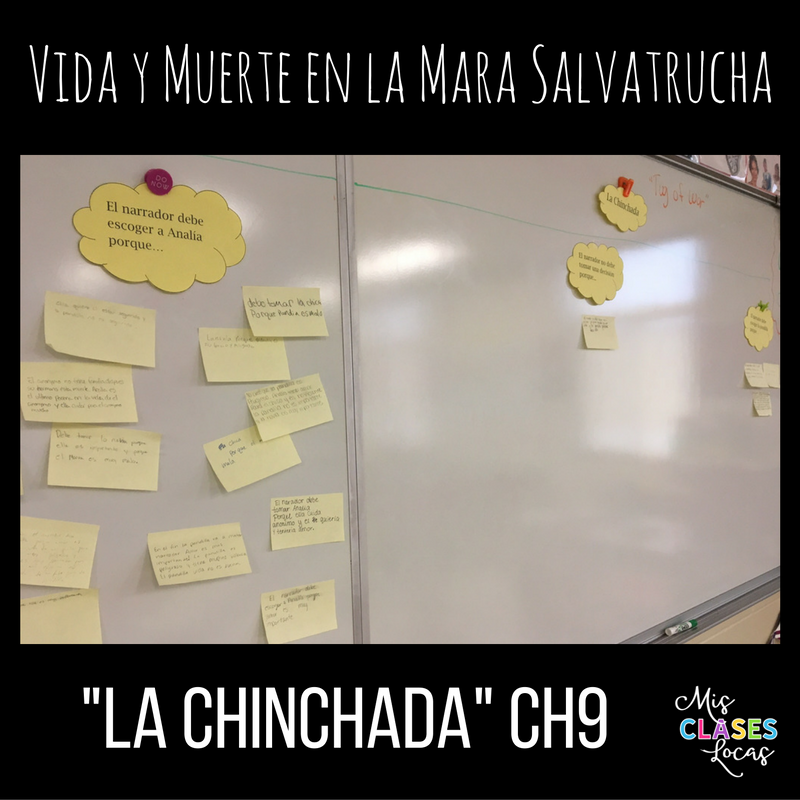 Resources for teaching Vida y Muerte - Check out these resources from around the web to get you started planning. Here is my plan for the first couple weeks of the overall unit, before starting the book itself. Students Read Chapter 1, the two sections of the prologue (the origins of MS13 and how do you become a member) on own and then we discussed them all as a class. For our Música miércoles we did the song Kalle by Los Rakas. Students read chapter 2 and then we discussed their moms and compared them to the mom in the book. Students read Chapter 3 and the section of the prologue, how did MS13 organize and gain influence. Students read the chapter and then completed a comprehension assessment from the new Teacher's Guide. I love how the new guide has assessments with higher order thinking skills like possible or probable. I let them use their book to complete it, since so many students are very black and white and do not get that there is not always a "right answer." I wanted them to actually try and cite evidence, so I let them use their book to help. This reminded me that I need to incorporate more of these higher order thinking skills to get students to do deeper. Students read through the Bestia slideshow from the Teacher's Guide. We compared it to our watching of the movie Which Way Home last year during out Esperanza Unit. Students read chapter 5 and the tattoo section of the Prologue. We went through the tattoo slideshow from the Teacher's Guide and these MS13 prison photos. Students were very interested in the gangs tattoos. 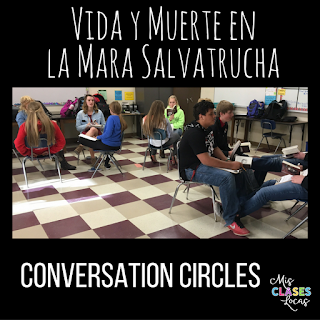 Conversation circles using resources from the Teacher's guide. I inserted You tube video timers in my projected slides, which made it quite slick. They talked about the topic for 3 minutes, wrote for 2 minutes about what they said, switched partners and repeated 3 times. See the picture below which shows how we did this without desks. In groups of 4 each person was either partner A,B,C, or D. Round 1 AB and CD talked, round 2 AC and BD talked, and then two people switched places so for round 3 AD and BC talked. I circulated listening with my clipboard for a mini formative interpersonal assessment. At this point the students are flying along pretty well with the super short chapters in the book. In their Spanish career with me they have already read quite a few books (Tumba, Robo en la Noche, Esperanza, Felipe Alou, La Llorona de Mazatlan, literature circle book of choice and weekly free reading). If this is one of your first books, you may want to keep at a chapter a day pace, but we moved up to two chapters a day so keep students from getting bored and to finish the book before the semester ends at Christmas break. I also stopped doing most of the regular pre reading and during reading discussion questions, because they were just too much for the short chapters. The fun ideas from the new Teachers Guide spice up chapter comprehension. While reading chapters 6/7, students completed a Smash Doodle (idea from Carrie Toth). The one below was the obvious stand out, as most were just much more basic with just pencil. 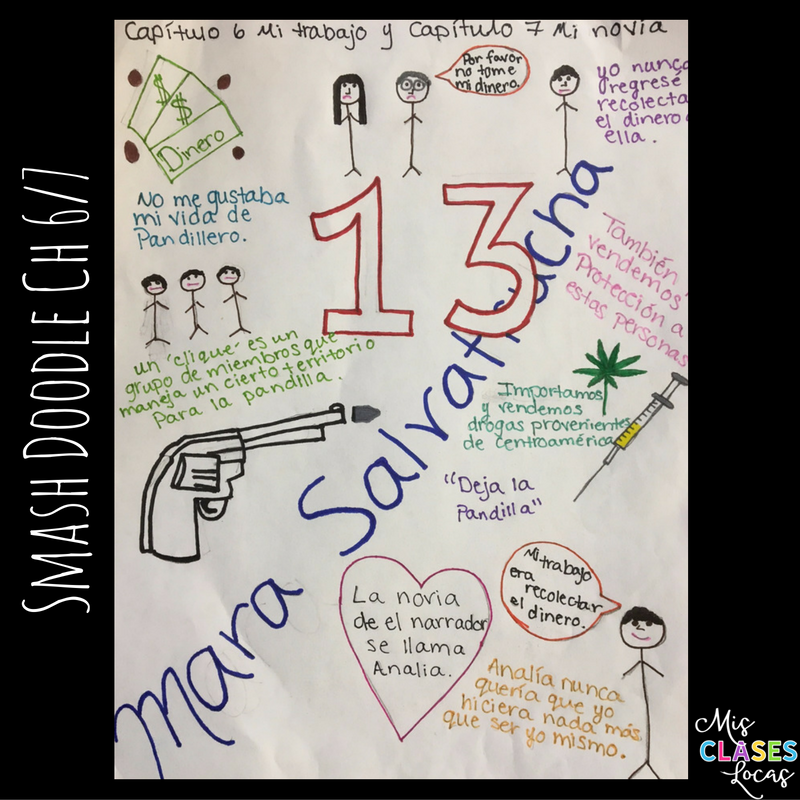 The next day students paired up randomly to ask each other about the chapter in Spanish using the smash doodles for reference. 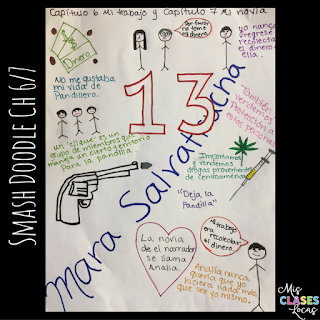 (Side note: if you were to look at this drawing out of content and not knowing Spanish, you would probably not guess it was for school or appropriate at all for that matter :/ I think that is why students like and can relate to this book so much. It touches on real life topics for them that most classes just avoid). 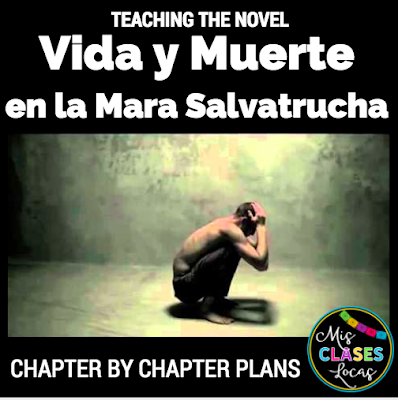 Besides moving to two chapter per day, we have also changed to the expectation that these chapters are read before class, so in class is where we may re-read and do activities related to the book. With an upper level class, this can be an expectation, but I would never do it with first novels for lower levels since they need that support of reading in class. Chapter 8 - We completed Readers Theater Amp'd Up from the new Teachers Guide. Well we tried to do the Amp'd up improv situation cards, but I realized that we have not done enough traditional readers theater without a script, and the students were having trouble both pulling dialogue out of the text and doing the complications all together. Next time, i would have a typed up reader's theater script so students felt more confident adding in improv too. Chapter 8 - Comprehension Assessment from the new Teachers Guide. Students did much better on this one, as they are really getting into the novel at this point. 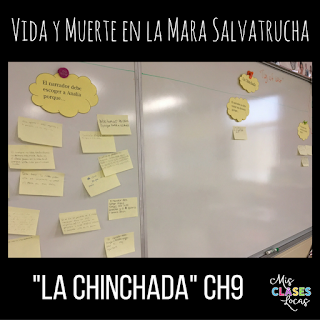 Chapter 9 - La Chinchada (Tug-of-War) from the new Teachers Guide. As you can see below, students wrote on big post it notes if the narrator should choose his girlfriend or the gang. As you can see I have a bunch of romantics who chose and defended love, which won the tug-of-war. Chapter 10 - We played the Marker Game (idea from Cynthia Hitz) to review Chapter 10. Here is the Ch10 Marker Game Rules & Questions Slideshow. It has 10 true/false questions from the chapter that students get to answer in a fun, competitive, active, non traditional way. With no desks or table anymore, the markers were on the floor between the chairs. The kids made the good call that they needed to be far enough apart that they did not bonk heads when diving for the marker! This is just an excerpt of my big slideshow that I use to project to keep myself and the students on track. Chapter 10 - Students completed the Comprehension Assessment from the new Teachers Guide connecting the events from the chapter with arrows to show the effect of each decision. Chapter 11 - Students worked in pairs to do Hula Hoop Venn Diagrams from the new Teachers Guide. The events were printed on colored paper and cut in advance by my awesome student assistant. Students arranged the events based on if they were the narrator or the girlfriends fault. I may have failed at actually getting the hula hoops, so they just made 3 columns. Due to being home and in the hospital with a toddler with strep throat, plans for the end of the book were altered. I was originally planning on doing the activities with the prisoner's interview and creating possible lawyer trial questions, with his responses, but plans change when you are not there to facilitate and assist. I went to the trusty Teachers Guide for ideas of what the students could complete on their own. They completed the Can Do Comprehension Ch12/13, answering questions and doing activities that moved up the Intermediate proficiency scale. We then discussed when I returned. With being gone, we did not do anything fancy with the last few chapters. Students read on their own, and we just discussed as a class the one day I was actually in class that week. Due to being a little rushed at the end of the semester, students just did a presentational writing, which was also their final. Melisa Lopez came to the rescue sharing the writing assessment she used for the unit. She gave me the idea to have students write about an event that changed their life, as many events changed the narrator's life. I adapted her out of class essay, to an in class writing. Unfortunately, quite a few of my level fours like to rely too much on online dictionaries. If I want to see what THEY know, I have to do pencil/paper in class writing. Thank you for this! I'm planning on teaching this novel in March. Wow! This is the most thorough, creative lesson plan I have found in my 12 years as a teacher. I love that you included all the sources, cited the creators, and even did links. THANK YOU for your generosity and attention to detail!! Thank you so much for this- this is incredible! Did you need to get permission to use this book due to content? I am considering incorporating this reader in my Spanish 4 class. Could you share the permission slip you send home for all movies and books you use? Do you list all by title, or is it a general one? Hi Allison! About the song Kalle before starting chapter two... do students have an activity to complete for this? How do you do your "Miércoles Música" activity? search Miércoles Música on this blog and you will see many ideas! basically I just played the song and we discussed it. would you be willing to share the assessment (in class writing) that you developed and mentioned above? 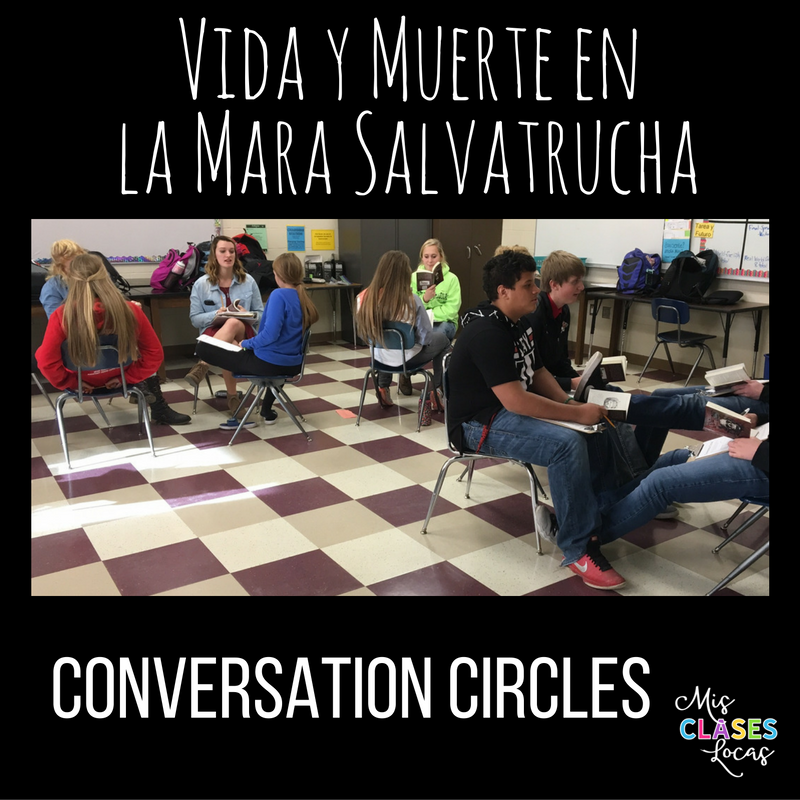 Leave Class on a "Teacher High"
Quick Tip: Free Books in Spanish!